HIPPO P-Models are driven by your truck engine, providing all the power you need with the smallest footprint available. 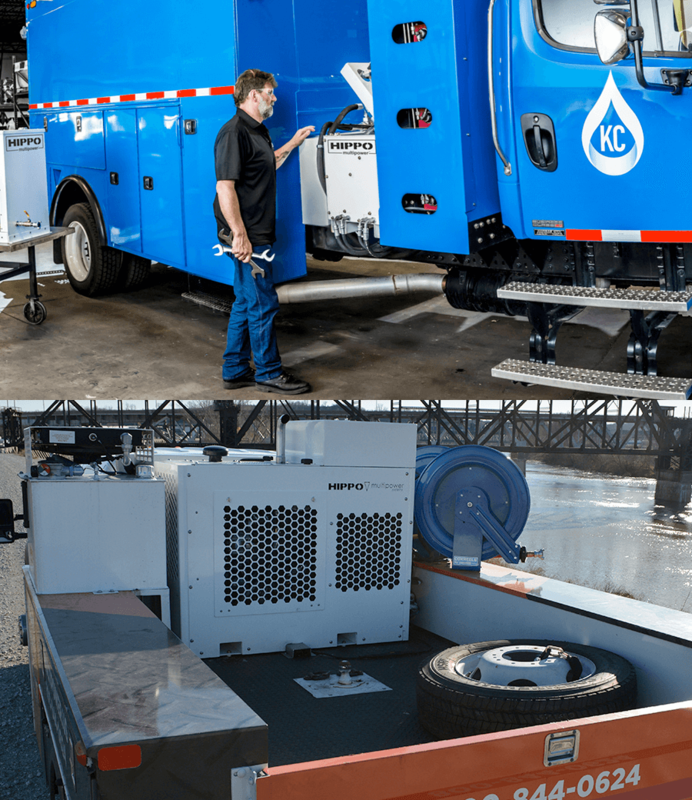 We connect directly to your truck’s PTO to provide hydraulic, air, electric and welding power all in a single, compact unit. One engine to maintain reduces downtime and maximizes efficiency. Our truck mounted units can be mounted curbside or streetside, giving you the ultimate flexibility to tackle any job. More power in less space and the ability to operate several functions simultaneously makes HIPPO the clear choice for mobile, multipower requirements. Designed to provide you with all the power you need, wherever you need it, HIPPO E-Models are truck mounted and don’t add idle hours to your truck’s engine. Each unit is self-sufficient—incorporating its own diesel engine to provide hydraulic, air, electric and welding power wherever you need it. The addition of an E-Model to your truck allows you to operate your HIPPO Multipower unit in states with even the most stringent engine idle laws. Need power in tunnels, mines or other confined areas? No problem with our diesel-powered HIPPO E-Models. A complete mobile power resource, the HIPPO Power Plant delivers four types of power from a single, highly efficient unit. Aberdeen Proving Ground tested and approved engineering and components, the Power Plant will perform in all severe duty applications. Need more air? We’ve got it. The HIPPO Hurricane takes the output of the Power Plant up one notch by delivering 100 cfm of air! No more busting your knuckles hitching up the pull behind compressor—the HIPPO Hurricane has the air power you need and then some. Don’t need hydraulic power? No problem. The HIPPO Power Pack is a smaller unit designed for truck mounted applications. Built with the same robust engineering HIPPO is known for, the Power Pack provides air, electric and welding from the bed of your truck. If you’re looking for a more compact unit with hydraulic power, the Power Pack Plus is the best choice for truck mounted applications that require hydraulic, air, electric and welding power anywhere, any time.